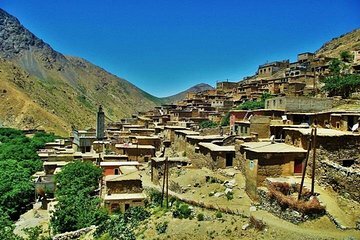 Challenge yourself on this intense but rewarding High Atlas day hike with a translator/guide on hand at all times to maximize your interaction with the local Berber people. Trek the Imlil Valley and Imnane Valley, including the 7,874-foot (2,400-meter) Tizi-n-Tamatert pass and the 6,070-foot (1,850-meter) Tizi-n-Aguersioual pass, with stops in Tinghrine and Imlil. For ease, your package includes door-to-door round-trip transfers from Marrakech.